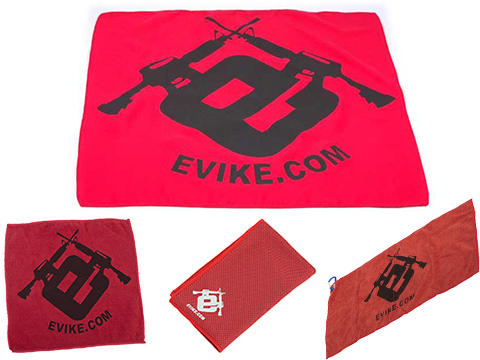 Here at Evike.com we aren't just fiends for airsoft. Our company is made up of shooters and fishermen, offroaders, climbers and backpackers and a wide spectrum of other outdoor enthusiasts. Outside of the office many of us spend our time out in the elements. 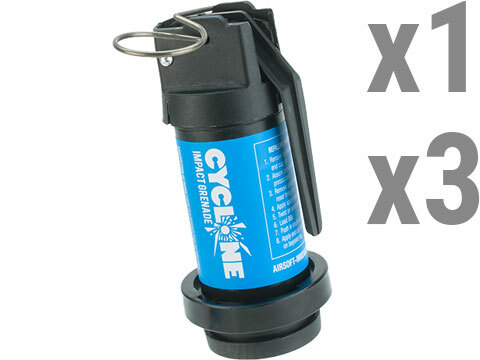 As purveyors of an immense selection of tactical gear we use most of our own products for the various weekend warrior adventures. 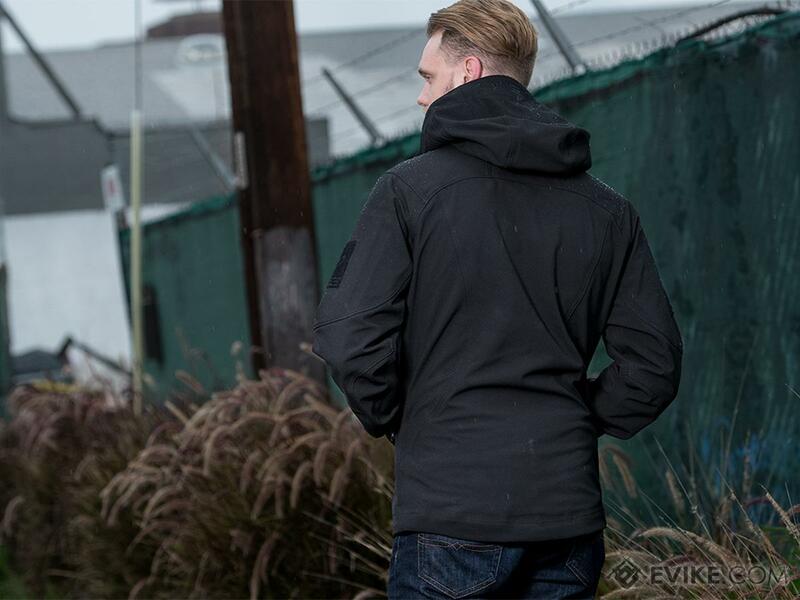 For years however, what has eluded us has been the perfect all-weather jacket. 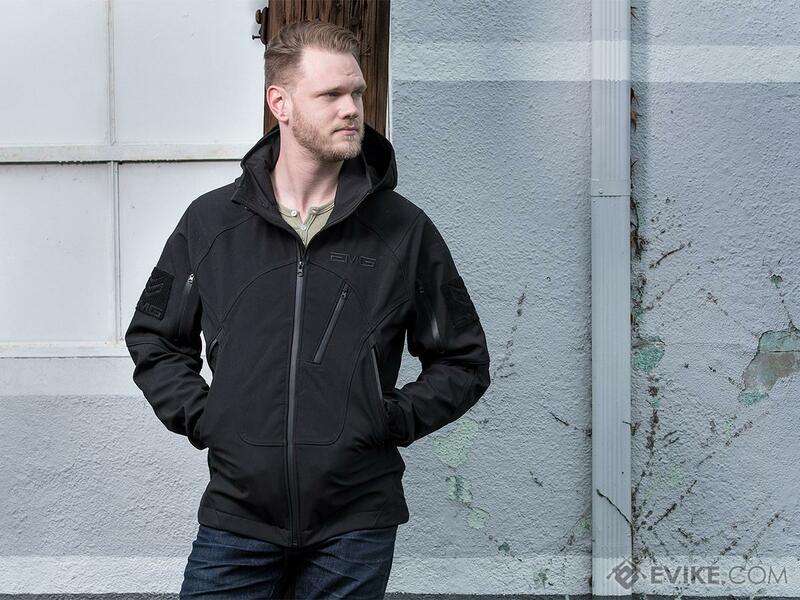 To fill this glaring hole in our collective gear bags we got to work designing a jacket that would fit all of our needs, the result is the EMG Reaper Softshell Jacket. 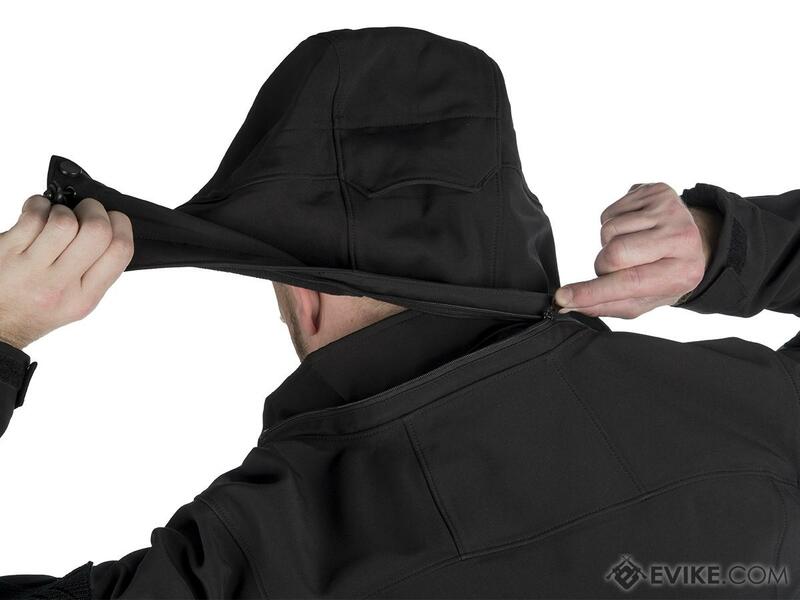 Designed from the ground up to be an affordable, reliable, durable and user friendly water resistant softshell jacket that you could turn to in most situations. 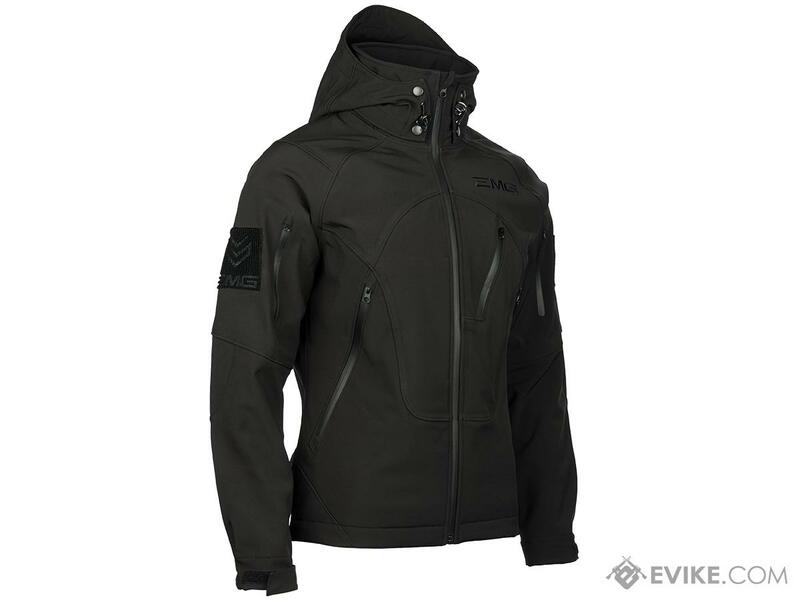 The base of the EMG Reaper Softshell Jacket is its water and wind resistant outer shell. 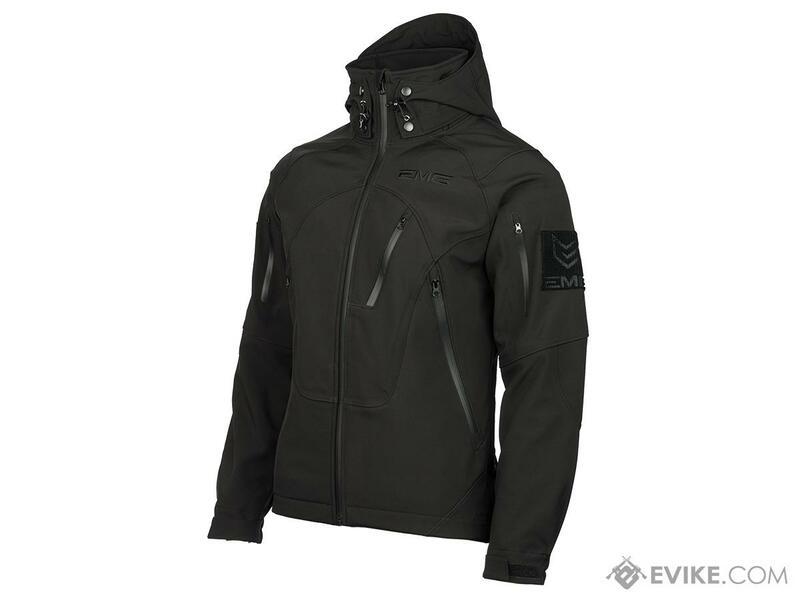 Made from military grade hydrophobic softshell material, the outer shell of the EMG Reaper beads moisture on its surface, preventing it from seeping into the inner lining keeping the wearer warm and dry in most conditions but still allowing the material to breathe. 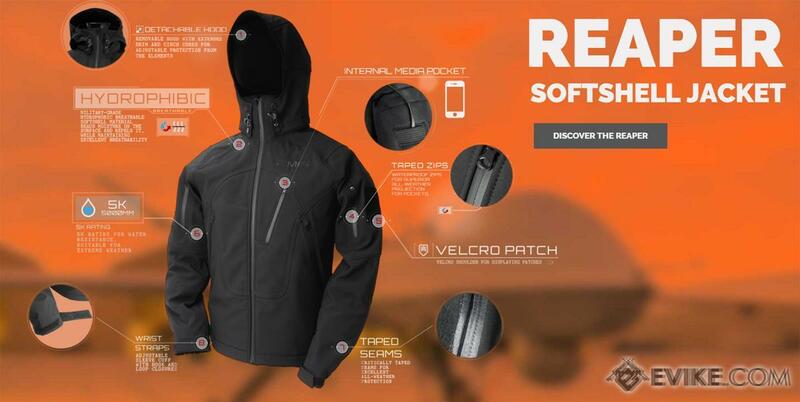 In most common softshell jackets, the weak point in the water resistance is in the seams. 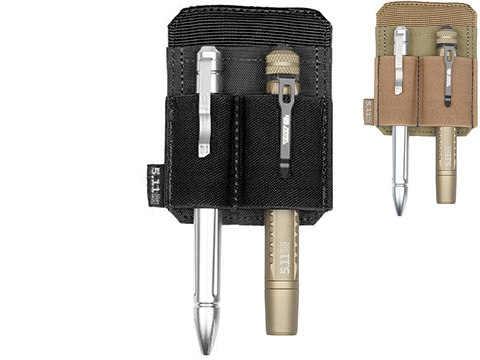 Cheaper manufacturers leave the stitched seams as is, leaving gaps in the water resistant membrane. 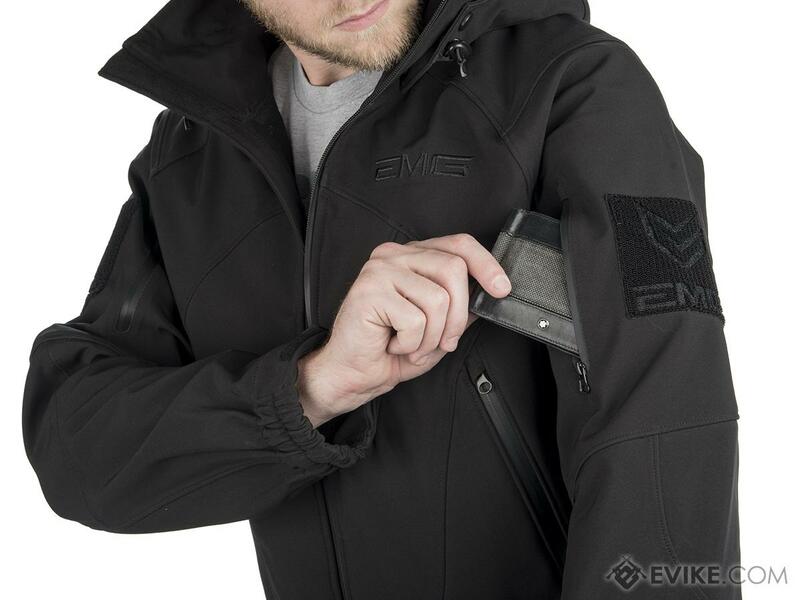 The EMG Reaper Softshell features water resistant taped seams at all sewing junctions eliminating leaks and seeps at shoulders, pockets and collars. 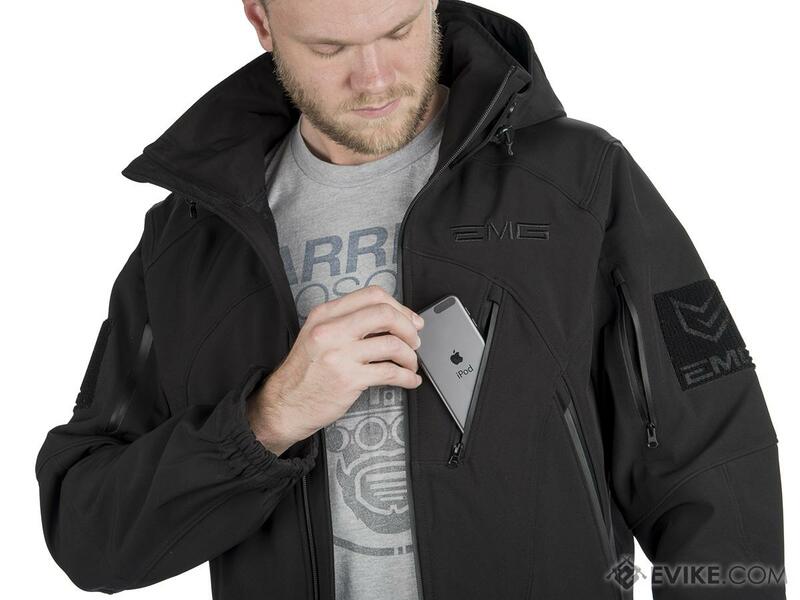 The EMG Reaper jacket utilizes taped water resistant zippers on all zippered pockets and the main front zipper keeping the stowed contents of the pockets dry and safe from the elements. 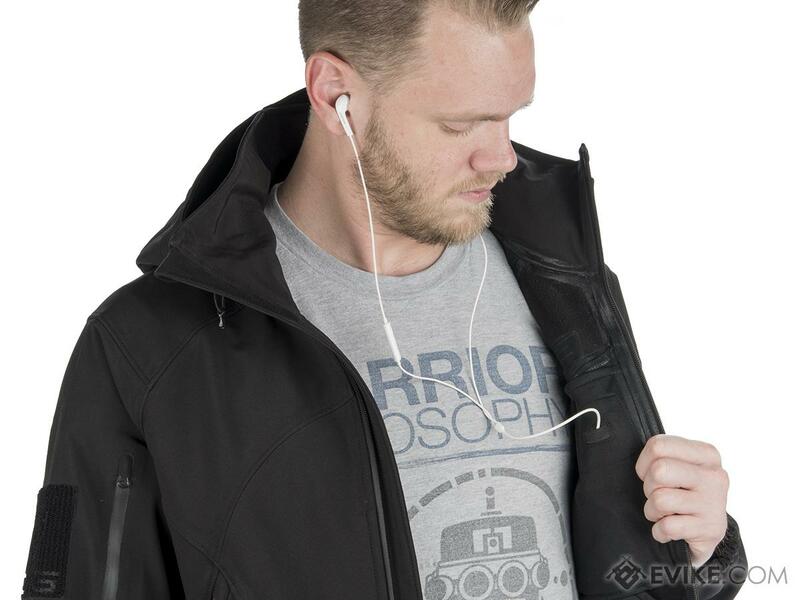 Internal fleece flocking provides the wearer with light insulation making the EMG Reaper the ideal jacket for transitional seasons, or for those who like us, reside in warmer climates, a perfect Autumn/Winter/Spring jacket. While the EMG Reaper is built beyond the standards of most readily available softshells on the market, its the small features that truly make it all our own. 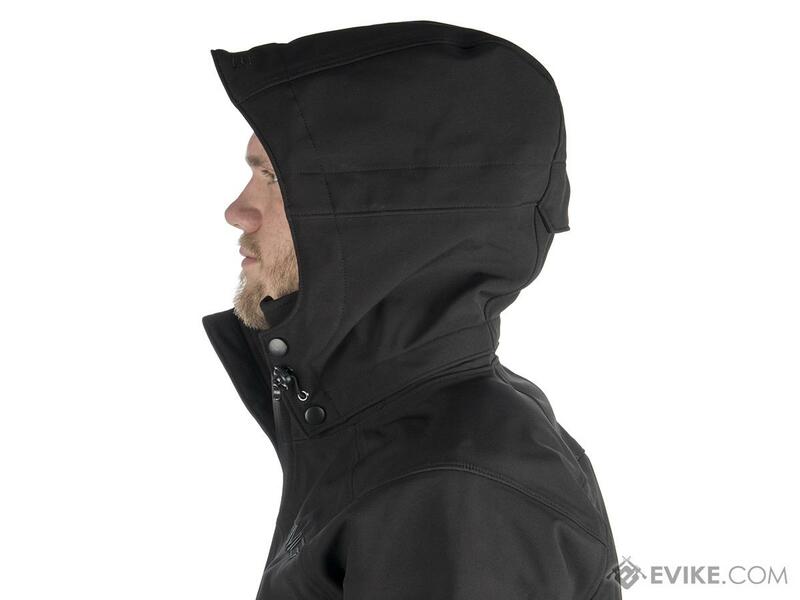 The removable hood with extended brim and cinch cords allows the user to remove the hood if it's not necessary or to cinch it up to keep the elements out in adverse conditions. 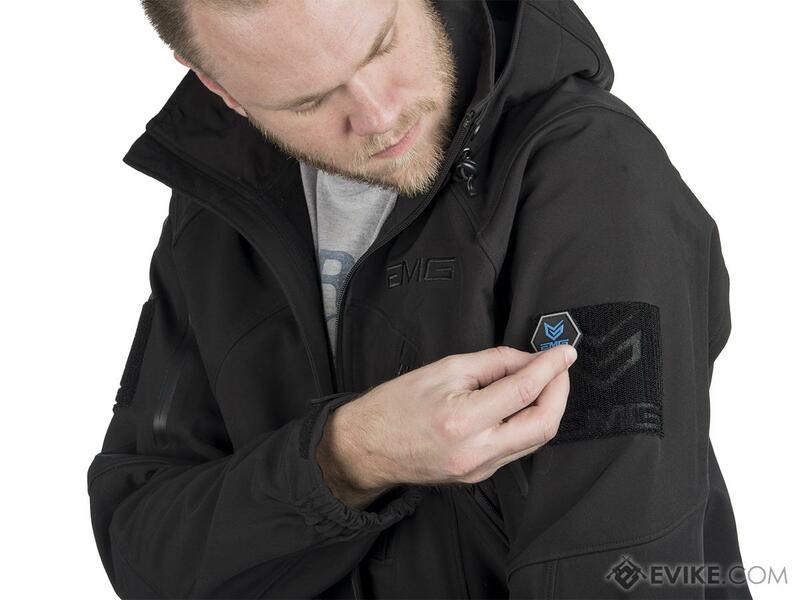 Both sleeves feature color matched loop fields with subtle EMG branding for your favorite morale or IFF patches. 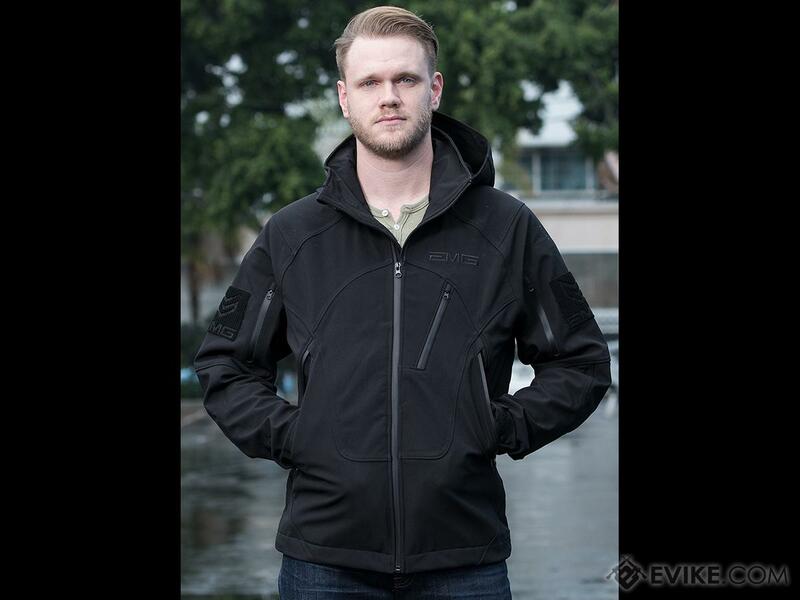 We are happy to offer the EMG Reaper jacket to our customer base as a purpose built piece of outwear designed by people who understand your passions and your need for gear that keeps up. 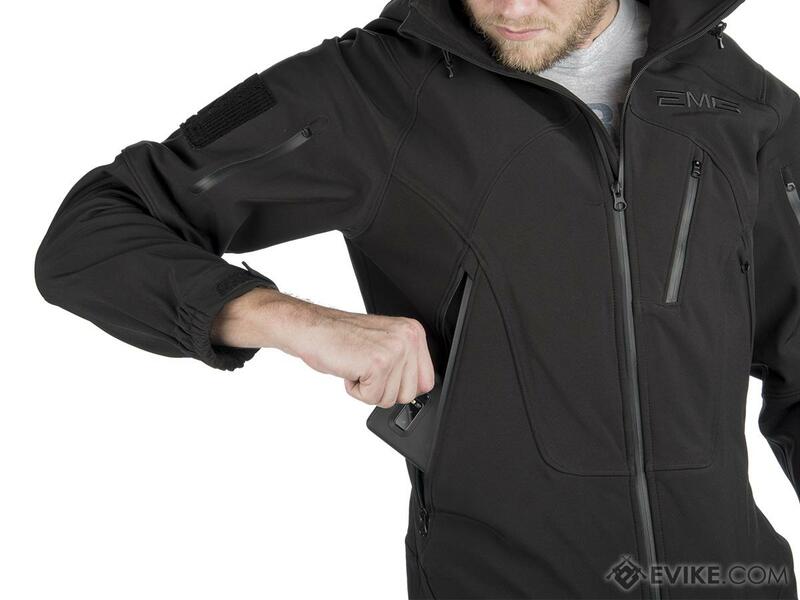 From the shooting range to the open range the EMG Reaper will get you there. 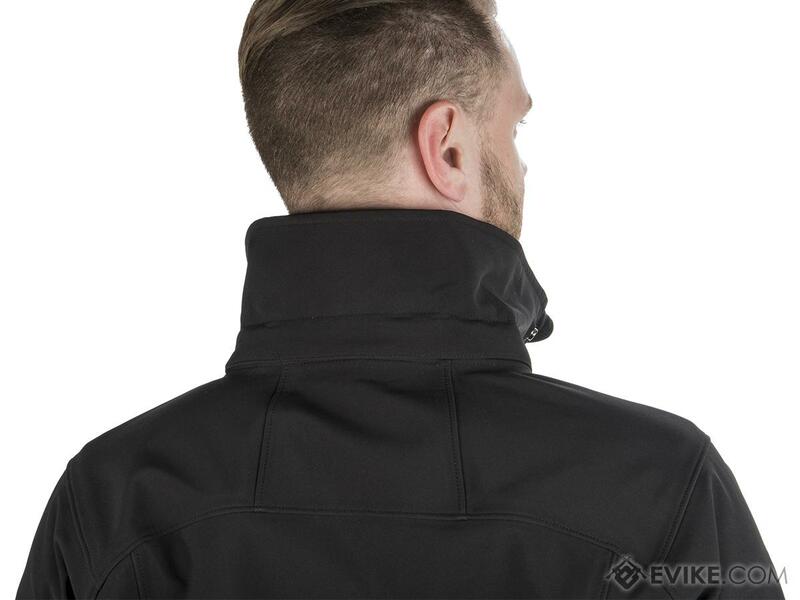 "Great coat for the price compared to a 800$ SPYDER coat it held its own!! 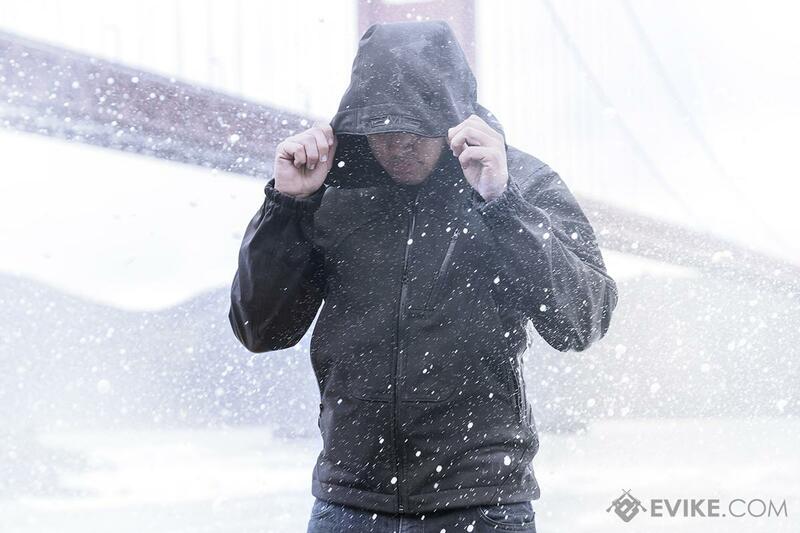 "I ordered this jacket for winter games. Fits good not too constraining around the chest, ordered an extra large because I was concerned it would be tight in the chest. Sleeves are perfect length. 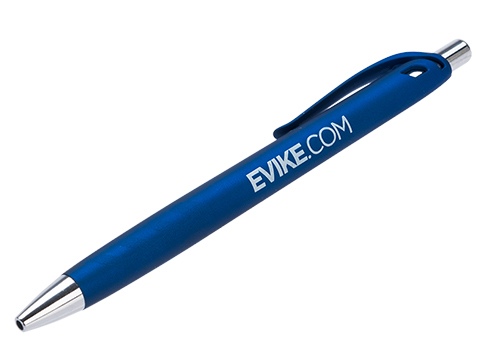 "I have one of these, and it's amazing. It never gets too hot or dry, and just feels nice all around. Love it! 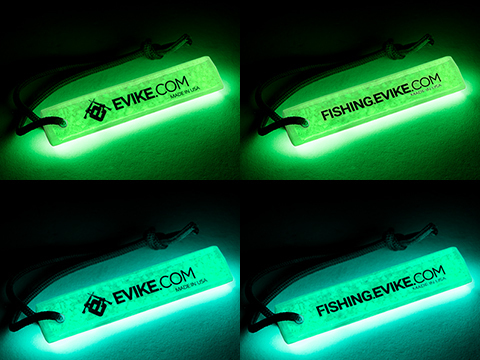 I use it for Airsoft, fishing and snowboarding! 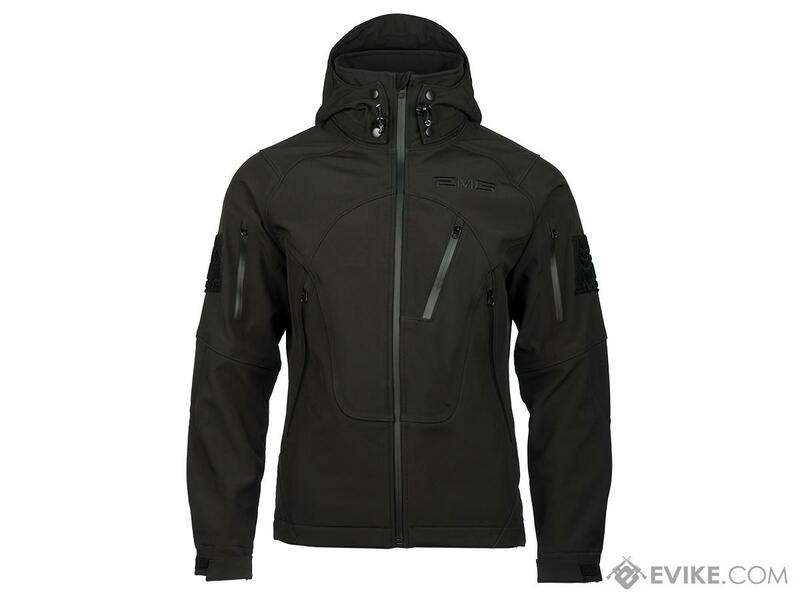 Discuss about EMG Reaper Softshell Jacket - Black (Size: Large) with your friends and fellow Evike.com shoppers!